Author: Turid Rugaas, ©, 2013. For species who live in packs it´s important to be able to communicate with its own kind. Both in order to cooperate when they hunt, to bring up their offspring, and perhaps most importantly: to live in peace with each other. Conflicts are dangerous - they cause physical injuries and a weakened pack, which is something that no pack can afford - it will cause them to og extinct. Dogs live in a world of sensory input: visual, olfactory, auditory perceptions. They easily perceive tiny details - a quick signal, a slight change in another´s behavior, the expression in our eyesÉ Pack animals are so perceptive to signals that a horse can be trained to follow the contraction in our pupils and a dog can be trained to answer your whispering voice. There´s no need to shout commands, to make the tone of our voice deep and angry - what Karen Pryor refers to as swatting flies with a shovel. your dog. 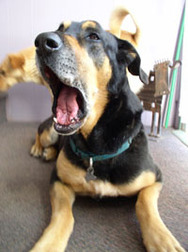 Some may simply give up using the calming signals, including with other dogs. Others may get so desperate and frustrated that they get aggressive, nervous or stressed out as a result. Puppies and young dogs may actually go into a state of shock. finds dad´s voice to be aggressive, and being a dog he instantly give dad a calming signal in order to make him stop being aggressive. Prince will perhaps lick his own nose, yawn, turn away - which will result in dad becoming angry for real, because dad perceieves Prince as being pig-headed, stubborn and disobedient. Prince is punished for using his calming signals to calm dad. This is a typical example of something that happens on an everyday basis with many dog owners. The dog may yawn when someone bends over him, when you sound angry, when there´s yelling and quarreling in the family, when the dog is at the vet´s office, when someone is walking directly at the dog, when the dog is excited with happiness and anticipation - for instance by the door when you are about to go for a walk, when you ask the dog to do something he doesn´t feel like doing, when your training sessions are too long and the dog gets tired, when you have said NO for doing something you disapprove of, and in many other situations. - or do something completely different. lighter colors, visible eyes and long noses. But anyone can use licking, and all dogs understand it no matter how quick it is. The quick little lick on the nose is easier to see if you watch the dog from in front. It´s best seen if you can find somewhere you can sit in peace and quiet and observe. Once you have learned to see the lick, you will also be able to see it while walking the dog. In most cases, this signal will make the other dog calm down. It´s a fantastic way in which to solve conflicts, and it´s used a lot by all dogs, whether they are puppies or adults, high or low ranking, and so on. Allow your dog to use it! 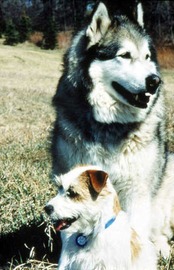 Dogs are experts at solving and avoiding conflicts - they know how to deal with conflicts. used in many different ways - often the invitation to play is a calming signal by itself because the dog is making a potentially dangerous situation less tense and diverts with something safe. take part in the playing. see, especially because they remain standing in the bow position for a few seconds so that you have plenty of time to observe it. Sniffing the ground may be anything from moving the nose swiftly down toward the ground and back up again - to sticking the nose to the ground and sniff persistently for several minutes. Of course, dogs sniff a lot, also in order to ´read the paper´ and enjoy themselves. 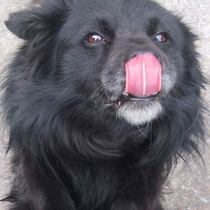 Dogs are pre-programmed to use their noses and it´s their favorite activity. However, sometimes it´s calming - it depends on the situation. So pay attention to when and in which situations the sniffing occur! hunting behavior and is triggered by the sight of a running human or dog. If the one running is coming straight at the dog, it involves a threat and a defence mechanism sets in. calming signal, I immediately respond by moving slower. him to want to calm you down by walking slowly. Have you ever been angry with him when he came to you? Then this may be why he doesn´t trust you. Another reason to calm you may be if the dog is always put on a leash when coming when called. Take a look at your dog the next time you call him. Does he give you any calming signals when coming? If he moves slowly, you may need to do something different in the way you act. "Freezing" - is what we call it when the dog is stopping while standing completely still, sitting or laying down and remain in that position. This behavior is believed to have something to do with hunting behavior - when the prey is running, the dog attacks. Once the prey stops, the dog will stop too. We can often see this when dogs are chasing cats. This behavior, however, is used in several different situations. When you get angry and aggressive and appear threatening, the dog will often freeze and not move in order to make you be good again. Other times the dog may walk slowly, freeze, and then move slowly again. Many owners believe that they have very obedient dogs who is sitting, lying down or standing completely still. Perhaps they are actually using calming signals? 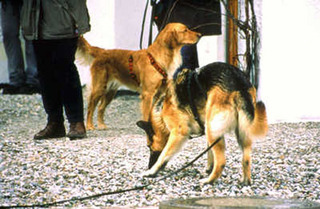 Very often a dog will stop and remain calm when someone is approaching. If your dog wants to stop or move slowly in a situation like that, then let him. Also, should your dog be in a conflict situation with a human or dog, and is unable to escape, freezing may be one way to calm the other dog or person. To sit down, or an even stronger signal, to sit down with the back turned towards someone - for instance the owner - has a very calming effect. 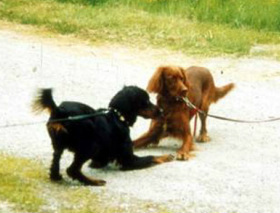 It´s often seen when one dog wants to calm another dog who is approaching too quickly. 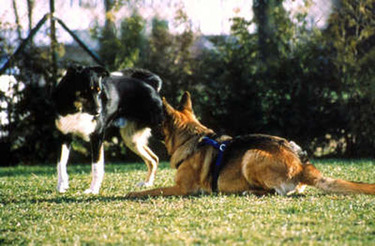 Dogs may sit down with their backs turned against the owner when he or she sounds too strict or angry. This signal is frequently used as a calming signal, and it is the main reason why dogs may react so strongly towards meeting dogs when they are forced to walk straight at someone.. Their instincts tell them that it is wrong to approach someone like that - the owner says differently. The dog gets anxious and defensive. And we get a dog who is barking and lunging at other dogs, and eventually we have an aggressive dog. Let the dog walk in a curve around a meeting dog! Don´t make him walk in a heel position while you´re going straight forward - give him a chance to walk in a curve past the meeting dog. If you keep the leash loose and let the dog decide, you will often see that the dog chooses to walk away instead of getting hysterical. Smiling, either by pulling the corners of the mouth up and back, or by showing the teeth as in a grin. Wagging the tail - should a dog show signs of anxiety, calming or anything that clearly has little to do with happiness, the wagging of the tail isn´t an expression of happiness, but rather that the dog wants to calm you. Urinating on himself. A dog who is cowering and crawling toward his owner while wetting himself and waving his tail, is showing three clear signs of calming - and of fear. · Wanting to get up into your face and lick the corners of your mouth. dog lays down with the belly up. Laying down with the belly towards the ground is a calming signal. he is turning his back to something. This is a clear sign of calming by for instance an annoying adolescent dog. supposed to have, and does have, a calming effect. close that he needs to be even more calming, so he starts walking in a curve and away from Prince - still slowly and now he is licking his nose too. Prince sits down, and looks away by turning his head far to one side. intense that it is best to stay away from each other. other times they feel that it´s safer to stay at a distance - after all, they have already read each other´s signals, they do so even at a several hundred meters distance - there´s no need to meet face to face. In Canada, dog trainers who attended my lecture, came up with a new name of these calming signals: ´The Language of Peace". That´s exactly what it is. It´s a language which is there to make sure that dogs have a way to avoid and solve conflicts and live together in a peaceful manner. And the dogs are experts at it. incredibly exciting, as well as educational. 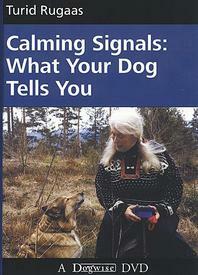 My bestseller: book about calming signals. Translated to more than 25 languages! An illustrated conference on canine communication. Take a look in the album about calming signals.